and the average customer lifetime is three years. The firm determines that the profit contribution is $180 before consideration of the initial acquisition cost (which means that CLV =$80). CLV is calculated as (-$100 + ($60 X 3)) = $80 (please refer simple CLV formula). In this case, the marketing ROI is ($80 / $100 = 80%). In other words, the marketing department has turned $100 into $180 by acquiring new customers. BUT the average customer lifetime period of 3 years is NOT considered in marketing ROI, because with a marketing ROI calculation, we generally only consider incremental results on a short-term basis, such as the first year only in this example. When only ONE year is considered in marketing ROI (which is common practice when measuring a campaign with short-term results, then the ROI in our example is negative 40% – that is, we lost money for the firm. The CLV calculation however, shows that the campaign had a positive contribution because profits from these customers continued for a further two years on average. 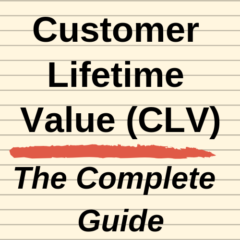 This means, particularly for marketing campaigns that deliver long-term results, calculating customer lifetime value will provide a better evaluation of marketing performance.